The first year following the death of a spouse is filled with many “anniversaries”, occasions that can stir up memories both happy and sad. This is a tough month for me. Last year at this time, I put my husband Dale into hospice and began preparing myself for the inevitable (as much as you can “prepare”). But it was a very special time; we made our amends and reaffirmed our love. I was able to make two of his wishes come true before he died: to receive his black belt and to be baptized. It was a very special time for our family – but one that brings back many smiles and many tears. It is hard to believe it has almost been one year. Look for more about coping with these special days in our next blog. If you are faced with losing a loved one due to a terminal illness, if I could tell you one thing, it would be to "carpe diem". Seize each day, each hour and each minute that you have with that person. When my husband was diagnosed with a malignant brain tumor, we knew he did not have much time. In the months that followed, he had very few good days, but when he did, I used that opportunity to make sure I had nothing left undone, nothing left unsaid, because you don't get a second chance once they are gone. 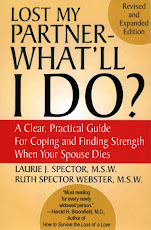 As Laurie has said, death is final but when my husband died, none of the tears I shed were because "I wish I would have...."
Thanks for the additional insights and advice inspired by your wonderful blog! when should i stop wearing my wedding ring?